Control Shot Direction - Learn The Nine Ball Flights. There are two factors that determine the direction the ball golf ball travels after hitting a golf shot. 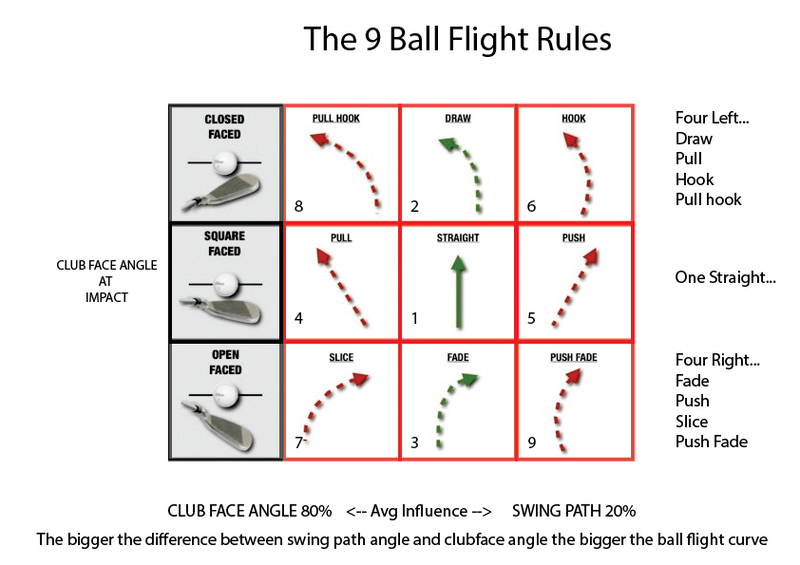 Each of those two factors have three possibilities making for nine different ball flights see the illustration below. There are nine possible ball flights (or shape of the shot). Four result in a shot that ends up to the left and four result in a shot that ends up to the right, one goes straight. The biggest influence on direction of a golf shot is simply where the club face is pointing when you hit the ball, hence the need for a good grip and good initial aiming before you start the swing. The more loft on the club you are using the easier it is to hit the ball straight. The simple reason is that loft adds backspin which counters sidespin which is what curves the ball. The wind of course also affects or exaggerates the shape of a golf shot and needs careful consideration when playing on a windy day. The slopes and hardness of the ground also determines the final stopping point of a shot if the slopes are severe enough to cause the ball to roll away after landing and would also need to be considered. After hitting a golf shot the ball can only travel in the direction you aimed it, left of where you aimed it or right of where you aimed it, fairly obvious of course. The tricky bit is understanding what combination of elements in your golf swing lead to the result you see. Whatever happens, the flight of the ball will always tell you what was happening through impact. The direction it started in and where it ended up tells you what direction you were swinging through the impact area and where the clubface was pointing at impact. Control those two elements and you control your ball direction – simple game really.